Tools became so powerful, omni-potent, that I started to consider them as a real digital matter to explore, as I explore sound, vibrations, pixels or sand. I wanted to give a new vision of the framework I use on a daily basis, Max MSP. All components in the framework are related and have particular relationships. Some are closer than the others, like those which deal with visual matrix processing & those others which deal with matrix on a more general point of view. Or those processing sound and those converting sound into numbers that we can use independantly. 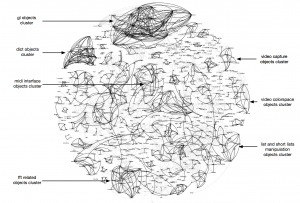 These relationships appear in the documentation but not on a visual way. It is named “see also” in the documentation. Basically, we can explore bricks related to the brick’s document we are currently reading. 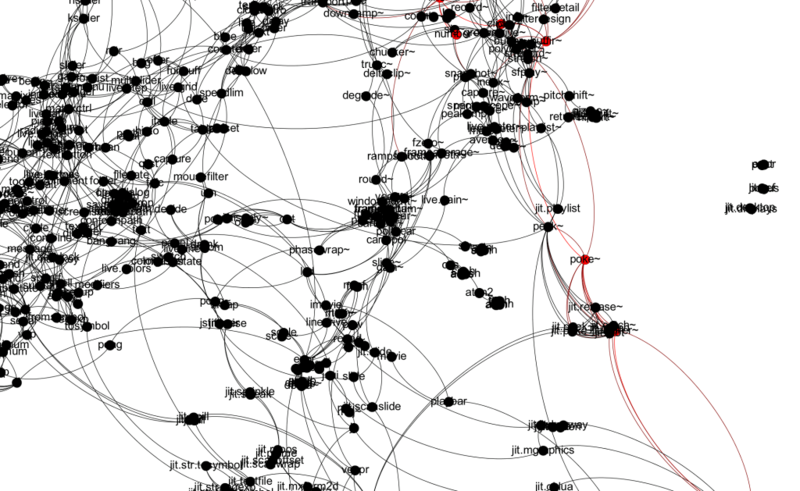 I had the idea of tracing, graphing all these relationships links, using graph theory. Darwin Grosse (Director of Education and Customer Services for Cycling ’74, editor & creators of MaxMSP) helped me by having provided me the global See Also whole relationships file. And here are few views of it.